Tired of the Lenovo Yoga reign in the convertible segment? Well, ASUS has a nifty solution that has everything that it takes to challenge the Yoga series. 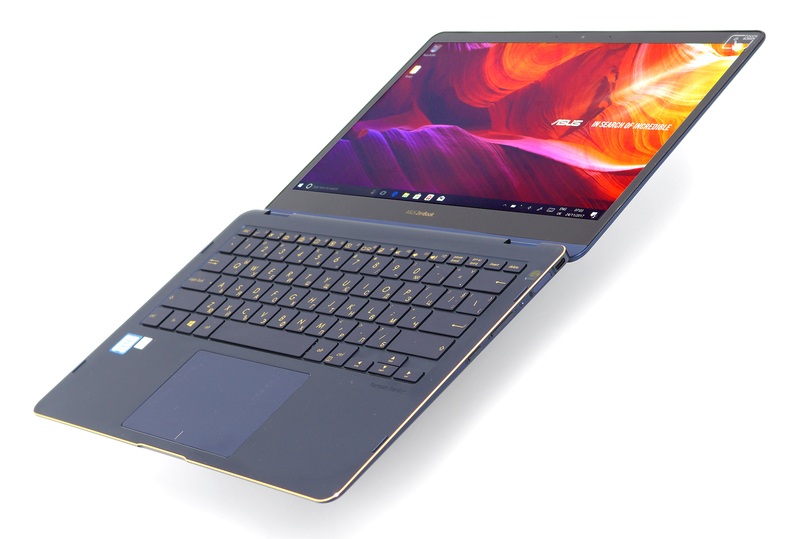 However, the ZenBook Flip S that we have with us raises some good questions – is it worth paying a bit extra for the ZenBook Flip S over the comparable Yoga solutions like the Yoga 720 and will the overly-compact chassis be able to provide enough airflow so it won’t cripple the quad-core Core i5-8250U CPU on board? But even if the laptop can’t keep the processor running at its maximum potential, the ZenBook Flip S has some compelling reasons to be your daily convertible. It has a premium all-aluminum chassis that exudes quality, excellent IPS 360-degree rotatable display, surprisingly good input devices, a handful of useful accessories including a portable dongle bringing the conventional I/O at your disposal and, of course, all of this comes in an extremely portable chassis. 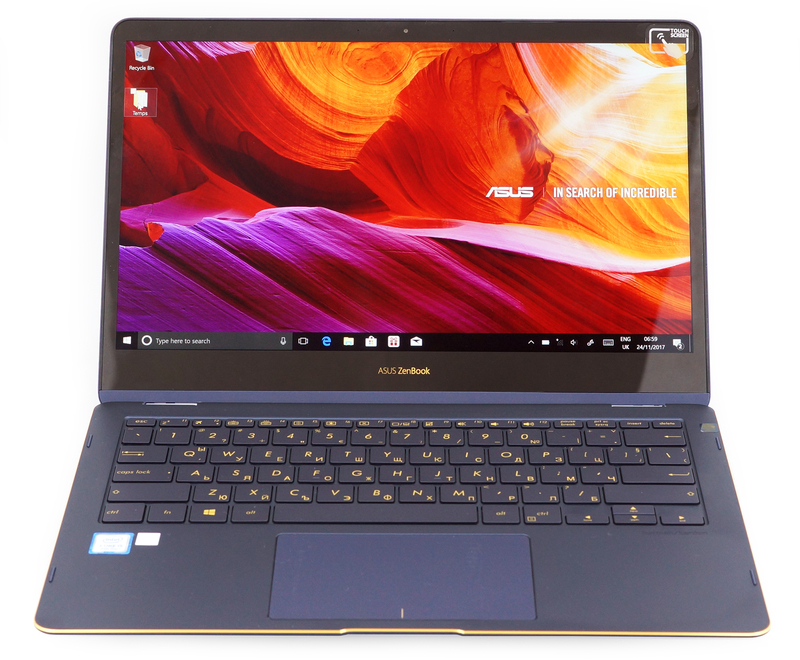 Some may say it’s an upgraded successor to the ZenBook Flip UX360 but in our opinion, it’s an entirely different product, especially when you consider the price upgrade as well. The devices comes in a luxurious matte box containing all of the usual user manuals, AC charger using the USB-C standard and an active stylus pen. And since the laptop comes only with USB-C connectors, ASUS has kindly provided a small dongle that comes with a full-sized HDMI, a standard USB-A connector and a USB-C port used for charging. An all-aluminum chassis painted in “Royal Blue” with gold-colored chamfered edges stand out from the crowd without compromising mobility. The device weighs just 1.1 kg and measures 10.9 mm in height. That’s downright impressive for a 13-inch device, especially for a one packing a ULV (ultra-low voltage) CPU like the Core i5-8250U. 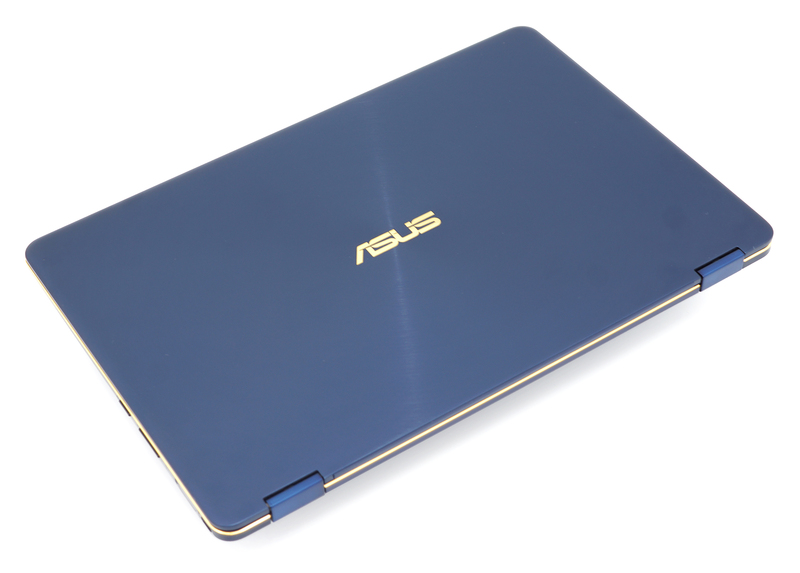 Anyway, the lid is the first thing that gives away the brand of the device – with ASUS’ logo in the middle and the concentric brushed aluminum surface around it, you can’t mistake the convertible for anything else other than a ZenBook. The plate itself feels pretty stable while the whole lid is almost impossible to twist. The hinges provide smooth and linear travel and allow the first few centimeters to be opened with just one hand. And if you open the panel just enough, the lid will lift up the notebook just a little – ASUS calls this ErgoLift hinge design but, to be honest, we barely felt the incline. 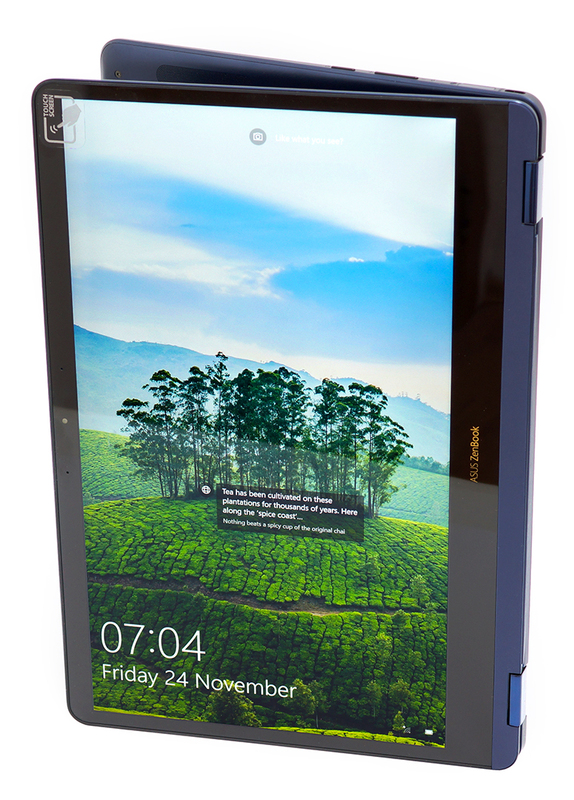 Anyway, the side bezels are rather thin and allow for smaller than most 13-inch laptops dimensions. And as for the bottom, it’s made of anodized aluminum and provide just four small grills for the loudspeakers. 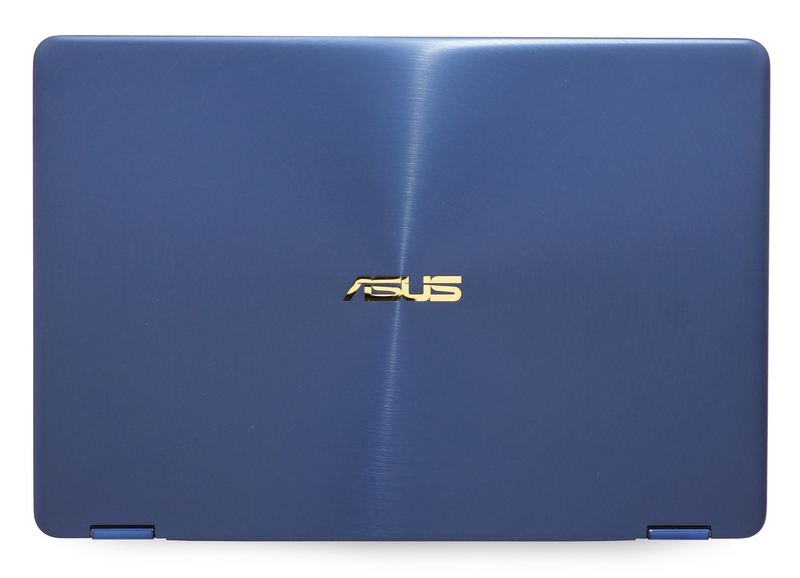 The sides are where the ZenBook Flip S impresses and disappoints the most. While the device sports incredibly thin 10.9 mm chassis, there are plenty of connectivity options that are left out. 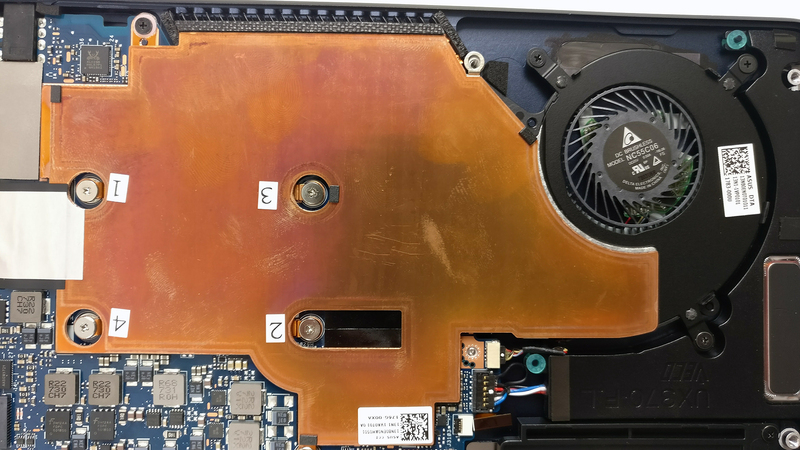 On the left, you will find just one USB-C 3.1 (Gen 1) connector also used for charging, a 3.5 mm audio jack and the main grill for dispersing the heat. On the right, you will find another USB-C 3.1 (Gen 1) port along with the fingerprint, which is placed in unusual position but it’s quite comfortable to reach when in tablet mode, and the usual volume rocker and power button. Considering the price, at least one Thunderbolt 3 or USB-C Gen 2 port would have been greatly appreciated. Just two USB-C connectors don’t cut it even for a 13-inch device. 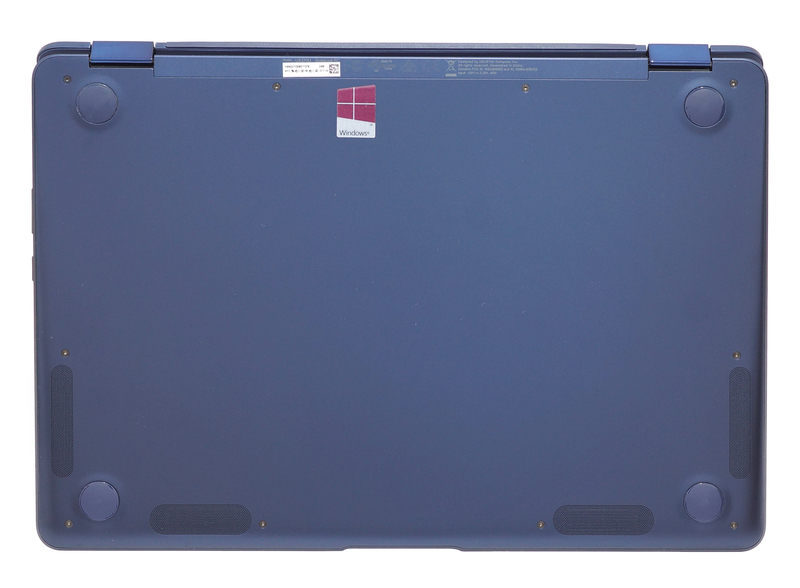 The interior is where the laptop shines and disappoints to some extent at the same time. 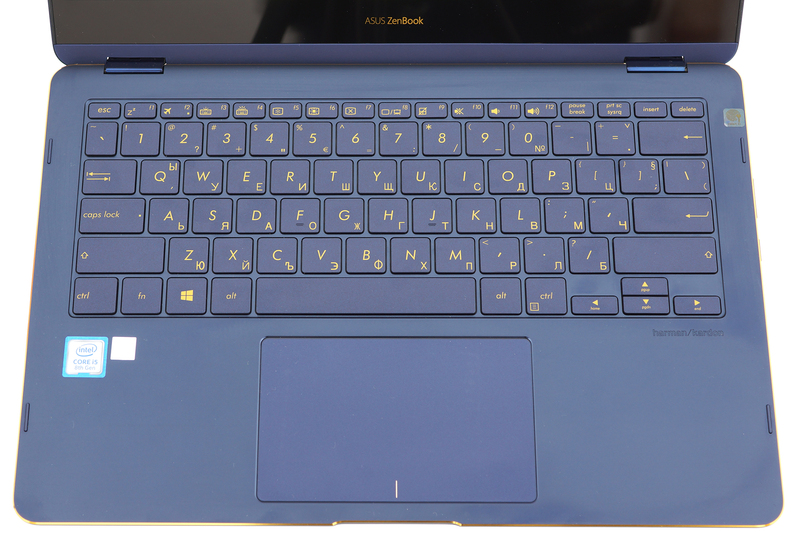 The anodized aluminum surface is a huge fingerprint magnet – so is the exterior, of course, and the Royal Blue color makes the smudges even more visible – and fails to impress with sturdiness. It’s not necessarily bad or too flexible since it’s an ultra-portable convertible, but pressing the middle of the keyboard and the wrist rest area results in visible deformation. The input devices, on the other hand, fit the device’s price and are surprisingly good given the limited space. 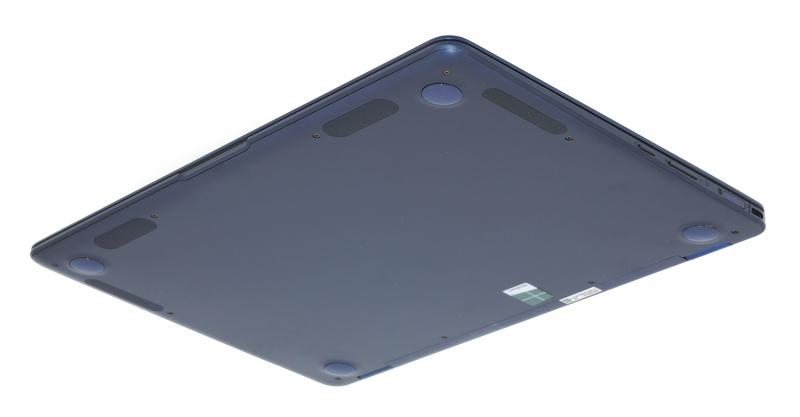 The trackpad features light mouse clicks, buttery-smooth gliding surface and excellent responsiveness. In addition, it’s pretty big for a 13.3-inch device. The same kind words go for the keyboard too – it doesn’t feel small at all, the key spacing is nice, the keycaps are fairly big and despite the rather shallow nature of the keys, the tactile feedback of each keypress makes it a great keyboard. To sum things up, the ZenBook Flip S is a well built and extremely portable premium device that’s definitely an eye-catcher. Along with the comfortable input devices, the ultrabook justifies the slightly higher. However, the fingerprint magnet surface and the flexible interior keep us from giving the ZenBook Flip S a perfect score. Accessing the internals is pretty easy, although you can’t really do much with it as the notebook’s one and the only option for upgrade is the storage. Anyway, removing the screws on the bottom and prying up the plate will reveal everything. 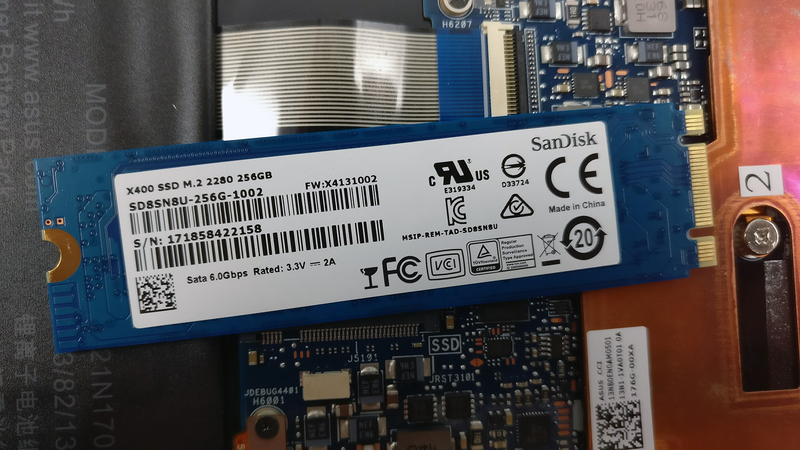 Despite the laptop being able to support PCIe NVMe SSDs, the unit we’ve tested featured a standard SanDisk X400 M.2 2280 SATA SSD. This is rather disappointing given the price point of the product but we assure you, this is a strictly regional issue. Just make sure you are getting the PCIe NVMe version when ordering your unit. As expected, the motherboard comes only with soldered RAM so no further upgrade is possible. Make sure you are getting the configuration that will suit you. The unit we’ve tested came with 8GB of 2133 MHz LPDDR3 memory while the other available option is 16GB. The battery on this thing might seem like a big deal as it takes the most of the internal space but it’s actually rated at just 39Wh. This doesn’t mean, however, that the battery life isn’t good as you will see in further in the review. The cooling design is a blend between a passive and a standard cooling solution. A big copper plate covers the whole chip and takes the heat away to the cooling fan, which pushes it out from the left side of the chassis. The ZenBook Flip S comes with a Full HD (1920×1080) IPS panel with 13.3-inch diagonal, 0.153 x 0.153 mm pixel pitch and 166 ppi. 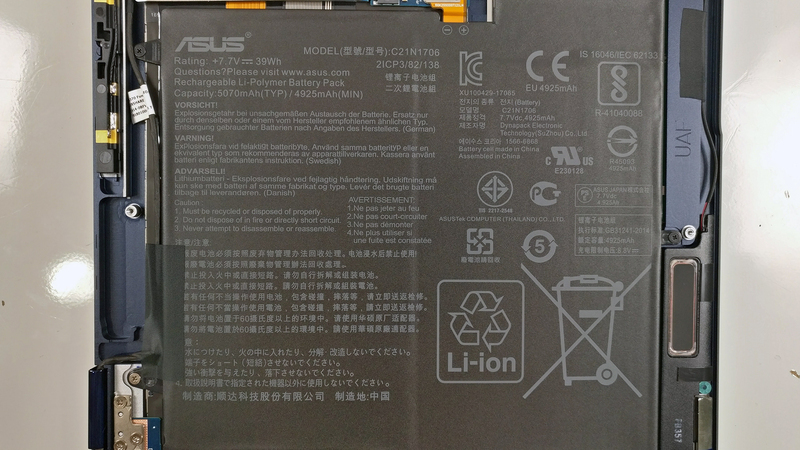 The panel is manufactured by AUO with model numberB133HAN04.2 and can be considered as “Retina” when viewed from at least 50 cm. The display has excellent viewing angles. We’ve recorded a peak brightness of 321 cd/m2 in the center of the screen and 314 cd/m2 as average across the surface with just 9% maximum deviation in the upper right corner. The correlated color temperature at maximum brightness is a bit colder than it should be – 7330K and it gets closer to the optimal 6500K as we go along the grayscale – 7040K. You can see how these values change at 140 cd/m2 (58% brightness) in the image below. The maximum color deviation dE2000 compared to the center of the screen should be no more than 4.0 and if you are planning to do color-sensitive work, it should be lower than 2.0. 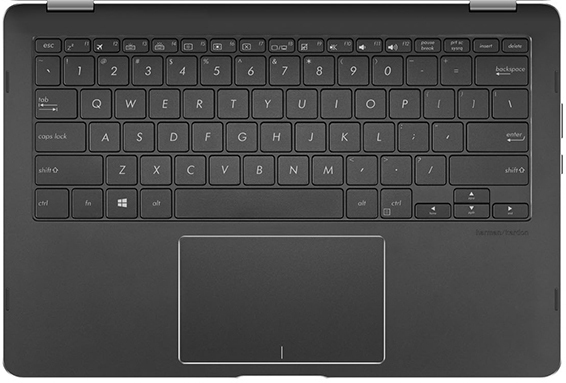 But in this case, since the laptop is going to be used mostly for multimedia, office work and web browsing, a deviation of 2.66 in the lower right corner of the screen can be overlooked. 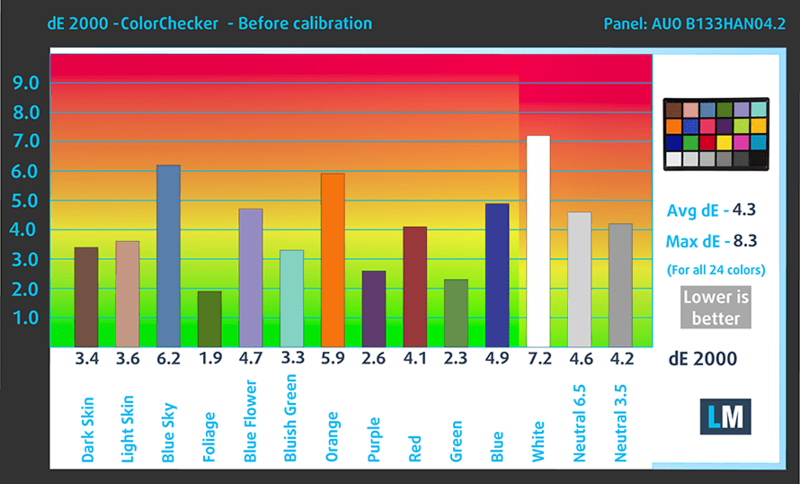 The contrast ratio is high – 1150:1 before calibration and 1090:1 after calibration. 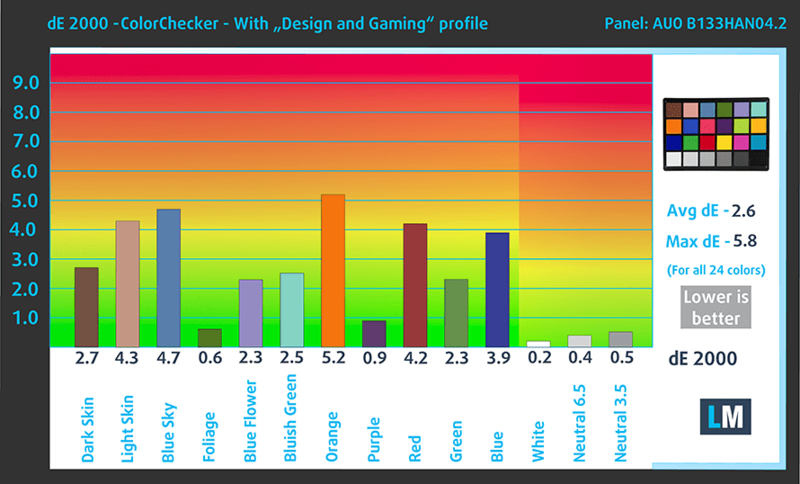 In this case, the panel covers 91% of the sRGB coverage so colors will appear rich and vibrant. Most of the web-based colors can be reproduced. We didn’t detect any light pulsations so the screen should be safe to use for long periods of time in this regard. The ZenBook Flip S like most notebooks from the lineup – it impresses with an excellent display. It offers wide sRGB coverage, high contrast, decent maximum brightness and doesn’t use PWM for regulating screen brightness. The sound quality is more than decent with clear low, mid and high frequencies. Even though the notebook’s tiny chassis carries a modest 39Wh battery unit, runtimes are downright impressive. Yes, sure, the video playback score is a bit lower than expected but the web browsing time is pretty good probably thanks to the energy-efficient Core i5-8250U CPU and the small 13.3-inch screen. Here you can see an approximate comparison between the CPUs that can be found in the ASUS ZenBook Flip S UX370UA models on the market. This way you can decide for yourself which ASUS ZenBook Flip S UX370UA model is the best bang for your buck. Here you can see an approximate comparison between the GPUs that can be found in the ASUS ZenBook Flip S UX370UA models on the market. This way you can decide for yourself which ASUS ZenBook Flip S UX370UA model is the best bang for your buck. The stress test that we perform don’t represent real-life usage but it gives us a good idea of how the system handles the Turbo Clock speeds and how well the cooling design will fare in the long run. During the 100% CPU load, the system was able to utilize the full performance of the chip before stabilizing at 1.9 GHz, which is still well above the base frequency and still within the Turbo Boost range. Running the GPU stress test resulted in CPU throttling but this is normal as the processor gives enough headroom for the iGPU to perform. Interestingly, the ZenBook Flip S gets warm around the wrist rest area on the left and around the “WASD” section of the keyboard. This is due to the positioning of the CPU, the copper heat dispersing plate placed on the top of the chip and the aluminum interior. Still, we doubt it will get uncomfortable unless you put it under the same stress test as we did. The build quality is mostly fine with the small exception of the flexible interior and the I/O is limited to just two USB-C connectors. Luckily, one of them supports display output up to 4K UHD. So if we leave that aside, for a bit higher price than usual, you are getting an excellent display with high contrast, wide sRGB coverage,e no PWM and decent maximum brightness. The device is also exceptionally portable thanks to the slim screen bezels and thin profile, yet delivering great user experience on the go due to the comfortable input devices and versatile nature. You even don’t have to worry about the battery life because the rather small 39Wh unit delivers impressive runtimes. 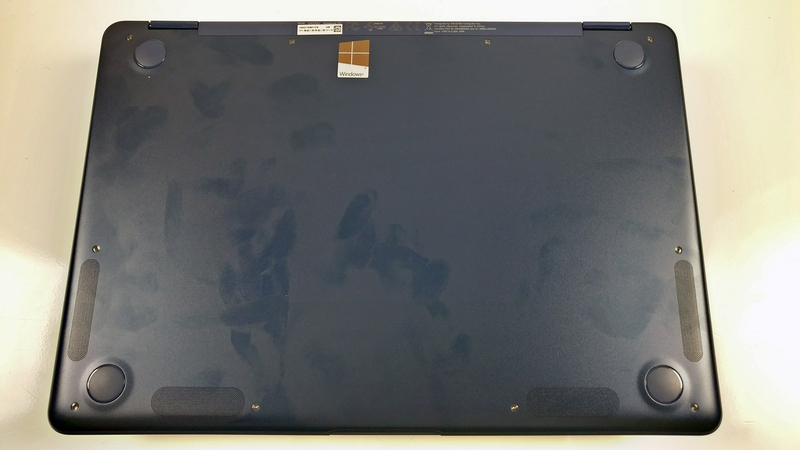 But it raises the question whether or not is worth over the 14-inch ZenBook Flip given the price tag. For roughly the same price, you can get the powerful version with discrete GeForce MX150 GPU and Core i7-8550U processor. You also get all the versatility and more I/O. Also, the ZenBook Flip 14 with Core i5-8250U will set you back a few bucks less than the Flips S. In any case, we strongly recommend considering the Lenovo Yoga 720 (13-inch) because it’s in the same ballpark and it’s an excellent alternative to the ZenBook Flip S with pretty much the same features. Still, it’s hard to come across such small 13-inch convertible that still utilizes Intel’s 8th Generation processors just as good as the Flip S.
where the hell are Asus Ryzen 2700u laptops? ?